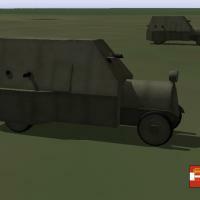 Two new armored cars for the Eastern Front. Both cars were produced in relatively low numbers, I'm including them for the sake of variety. The Russo-Balt Type C was produced by the Russo-Baltique motor car company. About 15 were built. 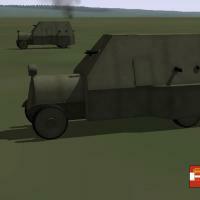 The armored car was built on a automobile chassis and had four gun ports, each with a Vickers machine gun. It had a crew of 4 or 5, had a top speed of 20 kph with a range of about 100km. The Russo-Balt Type C was used throughout the war and was used in the Civil War. The Junovicz P.A.1 was built on a truck chassis. There were different versions based on different trucks, about 5 were built. The armored car had six gun ports with 3 or 4 Schwartzlose machine guns. It had crew of 5, a top speed of 35 kph, and a range of 350km. The Junovicz P.A.1 was used on both the Galician and Italian Fronts. 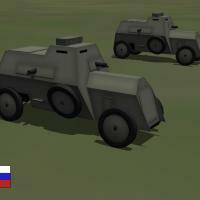 In First Eagles, the armored cars take the role of a tank, drop them into your ground object folder and First Eagles will randomly assign them to some of your Army Co-operation missions. Unzip the file and open my "GroundObject" folder. Copy the folders named "AustrianArmoredCar" and "RussBaltCar" to your FirstEagles/Objects/GroundObject folder. Both armored cars use the same skin for damage as my other armored cars. 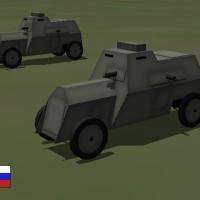 If you have already installed any of my armored cars, you may already have the file. If not, copy the file named "DestroyedArmoredCar.bmp" into your GroundObject folder. Note that the "DestroyedArmoredCar.bmp" file should not be inside any other folder.